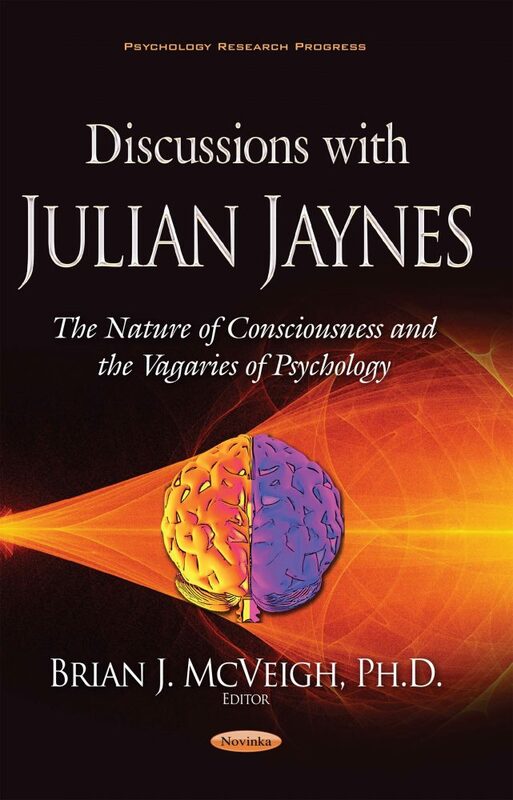 In 1976, the late Julian Jaynes of Princeton University published the groundbreaking The Origin of Consciousness in the Breakdown of the Bicameral Mind in which he argued that before the twelfth century BC, the minds of individuals were of a different neurocultural organization. Rather than being consciously self-aware as people nowadays think of it, the behavior of our ancient predecessors was governed by religiously-inflected “voices” and visions. These were produced by a “two-chambered” or “bicameral” mentality: language areas in the right hemisphere (the ruler or “god” side) organized advice and admonishments and coded them into hallucinatory experiences that were conveyed over the anterior commissure to the left hemisphere’s corresponding language regions (the follower or “person” side). Brian J. McVeigh, a student of Julian Jaynes, took the opportunity in 1991 to record a series of informal, wide-ranging, and unstructured discussions with Jaynes, considered a controversial maverick of the psychology world. Weaving their way in and out of the discussions are the following themes: a clarification of the meaning of “consciousness”; the relation between linguistics, consciousness and language study as a crucial method to reveal this relation; the history of psychology and its prejudices (e.g., the marginalization of consciousness as a research topic, ignoring socio-historical aspects of psyche, the significance of religion, the fraudulence of Freudianism, and the overuse, vagueness, and emptiness of “cognitive”); and some practical, therapeutic implications of Jaynes’s ideas on consciousness. This book will appeal to anyone interested in the emergence of consciousness, language and cognition, cultural psychology, the history of psychology, and the neurocultural transformation of our species. A glossary of names provides useful historical context. Bernard J. Baars. 1998. A Cognitive Theory of Consciousness. New York, NY: Cambridge University Press. Delumeau, Jean. 1990. Sin and Fear: The Emergence of the Western Guilt Culture, 13th‒18th Centuries. London, UK: Palgrave Macmillan. deMause, Lloyd, ed. 1974. The History of Childhood. Jason Aronson. Lanham, Maryland. Ellenberger, Henri. 1970. The Discovery of the Unconscious. New York, NY: Basic Books. Grünbaum, Adolf. 1986. “Précis of The Foundations of Psychoanalysis: A Philosophical Critique.” Behavioral and Brain Sciences 9:2, 217‒228. Haber, Ralph N. 1979. “Twenty Years of Haunting Eidetic Imagery: Where’s The Ghost?” Behavioral and Brain Sciences 2:4, 583‒594. Hallpike, C. R. 1979. The Foundations of Primitive Thought. Oxford, Clarendon Press. Jaynes, Julian. 1976. The Origin of Consciousness in the Breakdown of the Bicameral Mind. Boston, MA: Houghton Mifflin. Jaynes, Julian. 1979. “Paleolithic Cave Paintings as Eidetic Images.” Behavioral and Brain Sciences, 2:4, 605‒607. Julian, Jaynes. 1982. “A Two-Tiered Theory of Emotions.” Behavioral and Brain Sciences 5:3, 434‒435. Kuijsten, Marcel, ed. 2006. Reflections on the Dawn of Consciousness: Julian Jaynes’s Bicameral Mind Theory Revisited. Henderson, Nevada: Julian Jaynes Society. Kuijsten, Marcel, ed. 2012. The Julian Jaynes Collection. Henderson, Nevada: Julian Jaynes Society. Kuijsten, Marcel, ed. 2016. Gods, Voices, and the Bicameral Mind: The Theories of Julian Jaynes. Henderson, Nevada: Julian Jaynes Society. Lane, Timothy Joseph. 1987. The Left Hand of God: Trance and Divided Minds in Taiwan. Unpublished PhD dissertation, University of Pittsburgh. McVeigh, Brian J. 1991. Gratitude, Obedience, and Humility of Heart: The Cultural Construction of Belief in a Japanese New Religion. Unpublished Ph.D. Dissertation, Princeton University, Anthropology Department. McVeigh, Brian J. 2015. The Propertied Self: A Psychology of Economic History. Hauppauge, NY: Nova Publishers. McVeigh, Brian J. 2016a. How Religion Evolved: The Living Dead, Talking Idols, and Mesmerizing Monuments. Edison, NJ: Transaction Publishers. McVeigh, Brian J. 2016b. A Psychohistory of Metaphors: Envisioning Time, Space, and Self through the Centuries. Boulder, Colorado: Lexington Books. McVeigh, Brian J. 2016c. The History of Japanese Psychology: Global Perspectives, 1875–1950. London, UK: Bloomsbury. Nørretranders, Tor. 1998. The User Illusion: Cutting Consciousness Down to Size. New York, NY: Penguin Books. Ong, Walter. 1982. Orality and Literacy: The Technologizing of the Word. New York, NY: Metheun. Ruiz, P. and Griffith, E. 1977. “Hex and possession in the psychiatrists' approach to religion.” In Current perspectives in Cultural Psychiatry, edited by E. Foulks, R. Sintrop, J. Westmyer, A. Favazza, 93‒102. New York, NY: Spectrum Publishers. Schreber, Daniel Paul. 2000 (1903). Memoirs of My Nervous Illness. New York, NY: New York Review of Books. Spock, Benjamin. 1946. The Commonsense Book of Baby and Childcare. New York, NY: Duell, Sloan and Pearce. Weissman, Judith. 1993. Of Two Minds: Poets Who Hear Voices. Hanover, NH: Wesleyan University. Written for scholars, researchers, instructors, and anyone interested in what role Julian Jaynes and his theories have played in the history of psychology, and how his thinking has shaped our understanding of consciousness and its relation to history, evolution, language, and religion.